I know this sounds like a dinner full of gas but it is so good it is well worth it. I use Healthy Choice or Butterball brand turkey polish sausage. We think turkey is better because there is less grease. But if you want the full version use skinless sausage. I love the skinless, who wants that nasty wrap to eat through. This is a really easy dinner. I am making potato cakes to go with. Pour oil into large pan. I use a dutch oven. Heat oil over medium heat and add sausage. 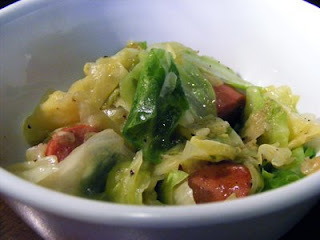 Brown on both sides and add cabbage. Salt and pepper very well. Cook over medium heat until cabbage wilts slightly but is still crisp. Make sense?? We like ours a little brown so we cook ours more. We don't like mushy cabbage. If you like cabbage more tender cook a little longer. This is really good with sweet cornbread and potato cakes. That looks good!! I LOVE cabbage--we had Indian Cabbage tonight--Biryani--cabbage and garbanzo beans in a cilantro curry sauce--I will have to try this one!